Φιλάνθρωπος – that is one of the words that we use to refer to Jesus in our hymnography and prayers. As a matter of fact, our terminology goes even further and we call him μόνος φιλάνθρωπος! He is the ONLY lover of humankind! So today we sang, in Tone 1: Glory to your resurrection, O Christ; glory to your kingdom; glory to your plan of redemption, O only lover of humankind. Δόξα τῇ Ἀναστάσει σου Χριστέ, δόξα τῇ βασιλείᾳ σου, δόξα τῇ οἰκονομίᾳ σου, μόνε φιλάνθρωπε. Indeed, today’s Gospel reading (Luke 8:26-39) is a perfect illustration: For many of us, Christ is the only lover of humankind. When a person experiences rejection and no love from other human beings, it is comforting to turn to the “only lover of humankind”! 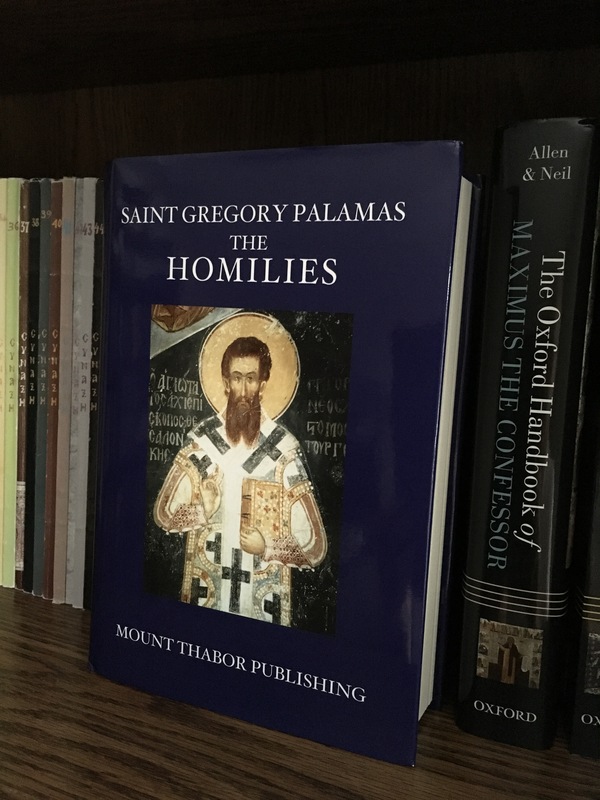 The Ormylia Foundation, To Ίδρυμα Ορμύλια, is associated with the Orthodox Convent of the Annunciation in Ormylia, Chalkidike, northern Greece, which in turn belongs to the Monastery of Simonos Petras on Mount Athos. Its mission is to comfort and alleviate the suffering of human beings without preference to race, religion, gender, or creed. Serving others through the use of medical science has been a special mission of the Orthodox faith since early Christian times, and there are many Orthodox saints who were doctors! The Ormylia Foundation supports those in need through practical works of love. The heart of the foundation is the Center for Social Advancement, Disease Prevention and Medical Research, “Panagia Philanthropini” Το Kέντρο κοινωνικής συμπαραστάσεως, ιατρικής προλήψεως και ερεύνης «Παναγία η Φιλανθρωπινή». The Center provides high quality standardized tests for early detection of breast cancer and other forms of cancer. Together with AIDS prevention and other medical services, the center provides spiritual and social support, humanitarian aid, public health education and other works of love for the people of northern Greece and many other countries in Eastern Europe. That is an interesting name, Φιλανθρωπινή – a rather unusual form for this adjective, at least by my knowledge of Greek. I’m not sure, but I’m guessing that it goes beyond the more usual φιλάνθρωπος. I’m guessing that this adjective denotes a very active form of philanthropy, akin to the life-changing decision of Mary to accept her role in the incarnation of Christ. This is the heart of the Christian faith: Philanthropy – the love of humankind. Philanthropy is not an emotion; it’s not even about giving money to a charity – although that can help. Philanthropy is first and foremost LOVE – an act of love, the love of humankind. One can be a philanthropist and still hate human beings! Φιλανθρωπινή: She who loves humankind. The holistic vision of physical and spiritual healing, together with social support, is what Christianity should be about. Healing cannot be separated from social support and spiritual restoration. All three dimensions of healing are there in today’s miracle story. And like so many of Christ’s miracle stories, it is a parable in action. You see, healing has to be holistic. Emotional or spiritual healing can leave behind a vacuum, just as in the teaching of Jesus. If the vacuum is not filled with love and social interaction, the result can be even greater emotional and spiritual turmoil. Human beings are not meant to live isolated lives; and we are not healed in isolation. That’s why Christ left a church behind – not as an institution. We have turned the church into an institution! The church is meant to be a place for healing – first and foremost! And perhaps that is why our churches are emptying – including our own church here in Portland. And the ones that are thriving are probably thriving for the wrong reasons. Why do people stay away from church and the Liturgy? Because they think they’re okay and they don’t need any healing? Because the church has forgotten its primary mission to be a place of healing? You probably never thought of this, but that’s not your fault: Throughout the Orthodox Church we have collectively forgotten why we are a church! We look for explanations elsewhere for our emptying churches: children’s sports on Sundays, language and other ethnic factors, the sameness of our Liturgy, boredom and apathy, etc. Sure, all these are factors; but I think the reason might be more basic than any of those explanations. We live in a society where people think they’re perfectly fine and they don’t need any help, thank you. And if they need help with something, there’s a pill for that. People are self-sufficient; they don’t need Jesus. They may believe in Jesus, they may glorify Jesus on a few special days in the year – but they don’t NEED Jesus! But here in the Liturgy our chaotic lives meet the presence of God. The kingdom of God is among us, and it’s both messy and beautiful. The Liturgy helps make sense of our lives, and we receive momentary glimpses of eternity through the icons and the prayers and the communion, just as light shines through our stained glass windows. The Word is made flesh right here and we see our lives transfigured. We are given strength and meaning to face the rest of the week – just as the apostles on the mountain of transfiguration received a vision that helped them return to the messiness back down from the mountain. Παναγία η Φιλανθρωπινή, I like that name in Ormylia Greece. Every church should be Φιλανθρωπινή! 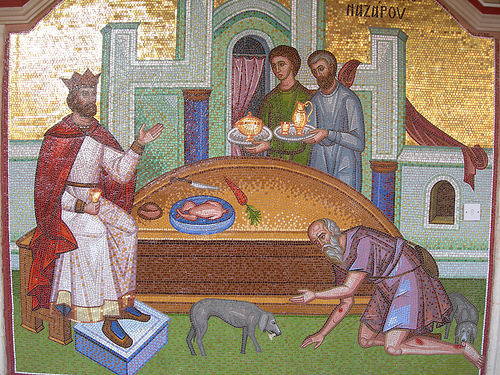 And every one of us should be philanthropos, reflecting the love with which we were first loved by Christ, the μόνος φιλάνθρωπος – the only lover of humankind. Categories: Sermons | Tags: church as hospital, empty churches, Jesus as lover, mission of church, Ormylia | Permalink. Seed falling on different types of soil: a beautiful image of how the same divine grace will produce different results in different people. But is divine grace the same for everyone? Every year in October we read the Gospel parable of the sower and the seed. 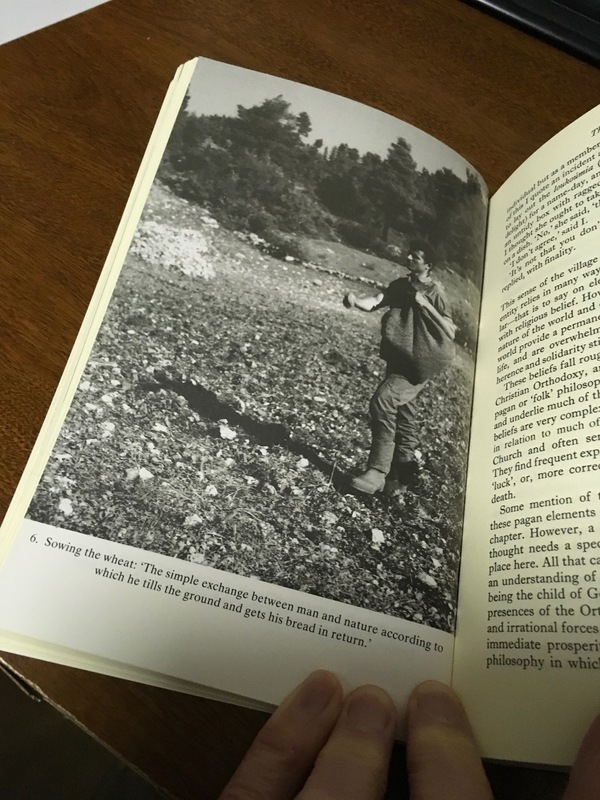 Not a coincidence, because October is the time when sowing takes place in Greece and the eastern Mediterranean – and of course it is in those lands that our lectionary was developed. Late October is the time for sowing oats, barley, lentils, beans, and of course, wheat. 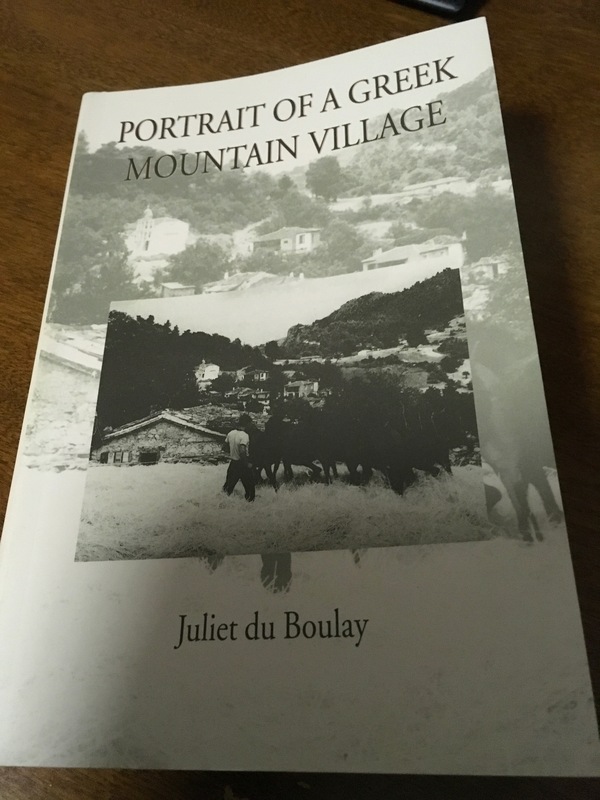 The book Portrait of a Greek Mountain Village by Juliet du Boulay describes the “Ecological Year” – in other words, the year of stewardship of the land. Ecology means stewardship of our home, oikos. Ecology has nothing to do with politics or anything political. It is simply about knowing the land we live on and our relationship to the land. It’s about recognizing our place in God’s universe. 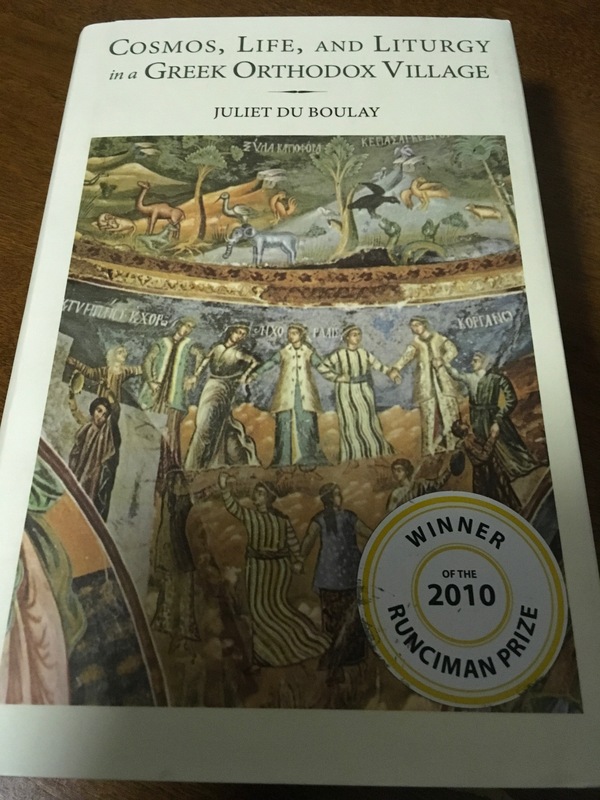 Juliet du Boulay wrote a second book about this same Greek village, Ambeli, a small, dying village in Euboea; a book with a very ambitious title, Cosmos, Life, and Liturgy in a Greek Orthodox Village. 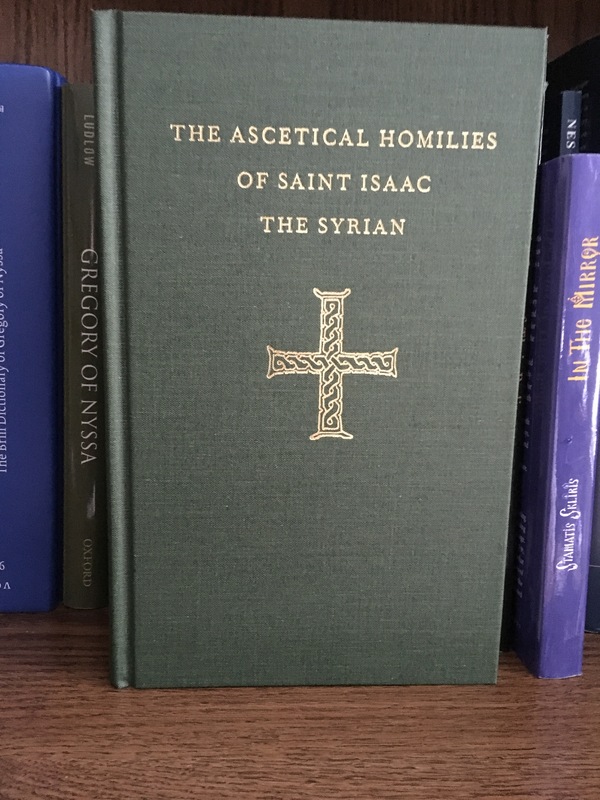 In the late 60s and early 70s this author lived in the village and experienced up close the unique bond between their physical existence on the land and their spiritual existence in the Liturgy and all the sacramental and sanctifying celebrations of the church year. Indeed, when you talk about the eastern Mediterranean you cannot separate physical from spiritual. They are uniquely inseparable. When dealing with the wild soil of that part of the world, the sower has no choice but to throw the seed and hope for the best yield. Undoubtedly there is ploughing to prepare the soil, and it happens in the first 2-3 weeks in October, but there’s only so much you can do with soil in that part of the world. And it is that part of the world in which Jesus lived and composed his parables. He didn’t have the American and Canadian prairies in mind, nor was he thinking of the rich green fields of California. Jesus knew how precarious the sowing of seed was in the real life of villages. And he also knew how precarious was the hearing of God’s word in the souls of people. Just as there are different qualities of soil and natural environments, so also there are different types of people and livelihoods. Some are hesitant, some are eager but quickly fall away, some believe but fall away when difficulties arise, some are so preoccupied with material goods that they have no room for spiritual goods. And some are receptive and stay receptive and cultivate a rich spiritual life in communion with God and God’s people. Is there any hope for those who fall away? The parable seems to say that there is no hope; they are lost. But maybe not. Different people receive Christ in different ways. In today’s world you hear the phrase, “There’s an app for that.” There are apps for practically every need. 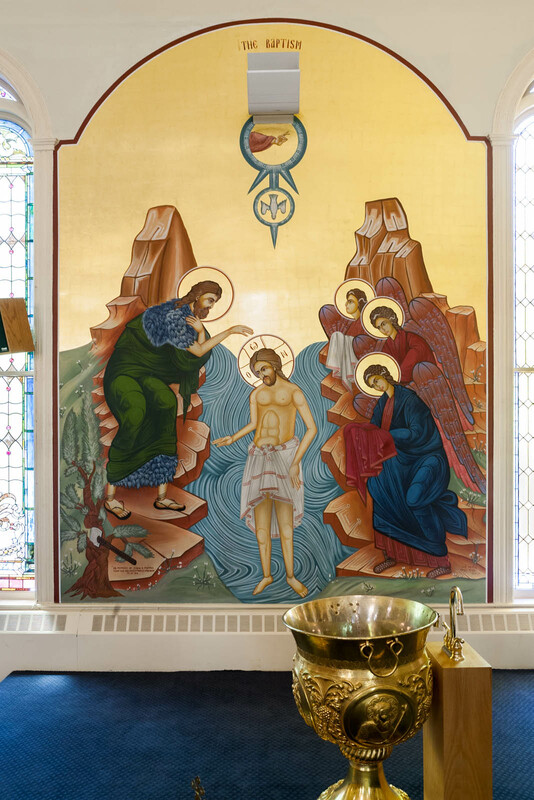 In the Orthodox Church we can say, “There’s an icon for that.” Yes, our icons are like apps; they respond to different people and different needs. Take the large wall icons in our church here in Portland. 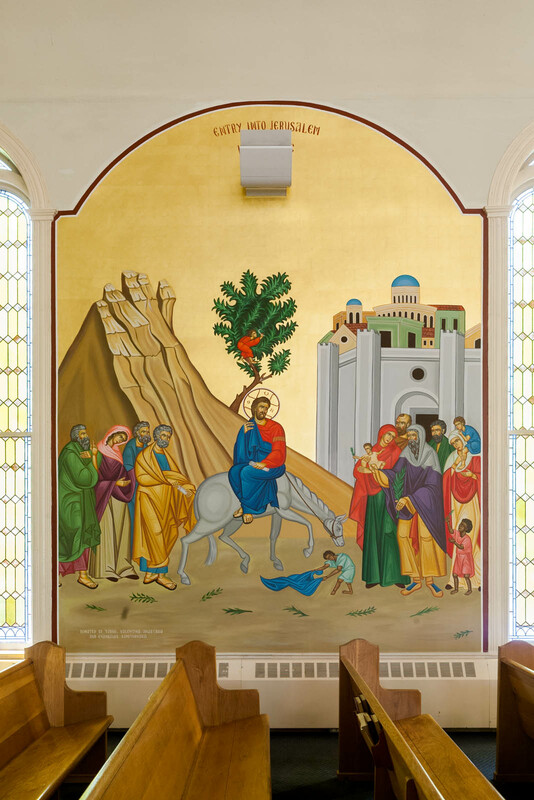 Some people don’t need the fanfare of miracles or dramatic conversion; they look for a God who enters their lives simply – the way Jesus enters in the Palm Sunday icon. Others want the fanfare, the miracles, the visions. They want God to show his glory, they want the shining light! For them, the icon of Transfiguration might be more meaningful and reassuring. Some people look for God in creation. They want a God who sanctifies our lives and our environment, who makes everything holy. Perhaps they can respond to the icon of Epiphany. 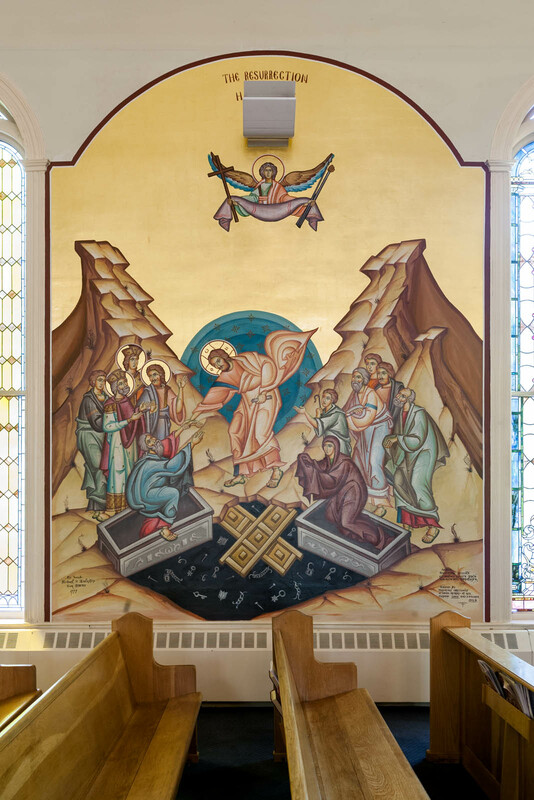 Other people are afraid of death and look for God to provide an answer to their fear of death; they might turn to the icon of Resurrection, which shows Christ trampling down death. 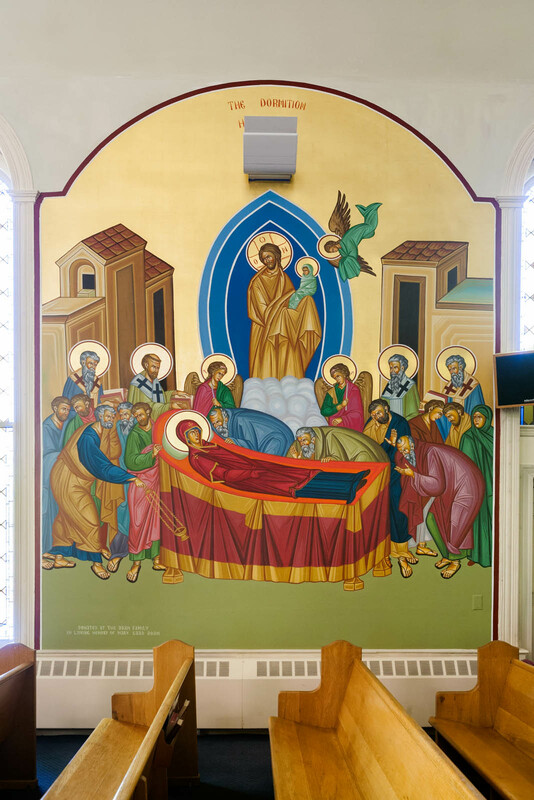 Some people simply want to get to heaven; they might be inspired by the icon of Dormition, which shows Christ receiving the eternal being of his mother Mary. Do you see how each icon can respond to different needs? Every one of us responds to the gospel according to the grace given to us and according to our ability. The church has an app for every person, according to where they’re at and what can most meaningfully communicate the gospel message to them. The church has an app for everyone. They’re called icons. Categories: Sermons | Tags: icons, planting seed, village ecology | Permalink.